Quick Reference Chart - Which wheel material should you use for your floor surface? Kingpin Diameter: 5/8"; Axle Diameter: 1/2"
Mounting Plate Size: 4" x 4-1/2" x 1/4"; Bolt Hole Spacing: 2-5/8" x 3-5/8"; slotted to 3" x 3"; Mounting Bolt Diameter: 3/8"; Mounting Plate and Leg Thickness: 1/4"
Performance TPR wheel provides unsurpassed durability and reliability. It combines the durability of a hard-tread wheel with the quiet floor protection of a soft-tread wheel. It’s made of thermoplastic elastomer, permanently bonded to a polypropylene core. It will not mark floors. It is resistant to chemicals, acids, bases, alcohols, salts, and steam. Pinnacle Wheel is an ultra-tough thermoplastic non-marking wheel. It is extremely durable, deflects floor debris and has high impact resistance. 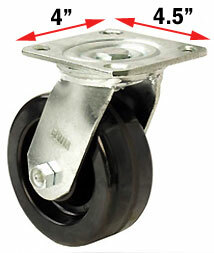 This wheel rolls easily with heavy loads and requires less force to roll and swivel than other hard tread wheels. Extremely resistant to water, most chemicals, solvents, salts and steam cleaning. Also known as mold-on rubber, the rubber on iron wheel is floor-protective, provides long tread life, operates quietly, and is highly resilient. Suggest for almost all kinds of floors and for a variety of applications. It's well-suited for towline applications of the kind often found in freight terminals or warehouses. The Signature Wheel has a lightweight, reinforced nylon core with a high strength non-marking elastomeric rubber tread. The round tread provides easy rolling. Our durable nylon core is six times stronger than polypropylene. The performance rubber tread is cut, tear and corrosion resistant and will not chunk out. It has the highest strength-to-weight ratio than any other wheel in the industry.